Two rival spymasters know the agent in each location. They deliver coded messages telling their field operatives where to go for clandestine meetings. Operatives must be clever. A decoding mistake could lead to an unpleasant encounter with an enemy agent - or worse, with the assassin! Both teams race to contact all their agents, but only one team can win. 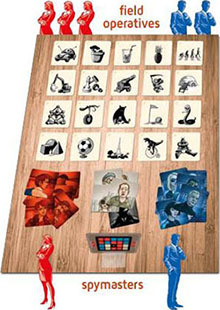 Codenames: Pictures is derived from the original Codenames game. 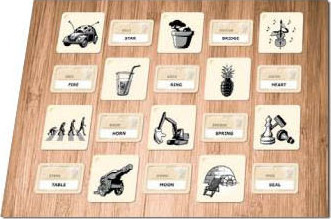 Instead of pictures coding for secret meeting locations, the original game uses words - the agents' secret codenames. There are some slight differences, but basically, the rules are the same: Two spymasters take turns giving clues consisting of one word and one number. Their teammates try to touch the correct codename cards. Words and pictures use slightly different modes of thinking. If you want to try it, think up clues for the example below. You can use any key card from this game. Each team chooses one player to be their spymaster. Both spymasters sit on the same side of the table. The other players sit across from their spymasters. They are field operatives. Randomly choose 20 pictures and place them on the table in a 5 × 4 grid. These represent locations where the field operatives can meet agents. The upper left corner of each card is marked to show you its intended orientation. Each game has one key that shows who can be found in each location. 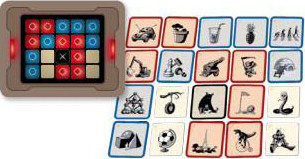 The spymasters should choose the key card randomly and place it on the stand between them, oriented the same as the 5 × 4 grid of pictures. Choose between the two possible orientations arbitrarily, without thinking about it. And don't let the field operatives see the key. The key corresponds to the grid on the table. Blue squares correspond to pictures that Blue Team must guess (locations with blue agents). Red squares correspond to pictures that Red Team must guess (locations with red agents). Pale squares have innocent bystanders, and the black square hides an assassin! The starting team must guess an extra picture, so they need an extra agent card. Flip this card to show the starting team's color and put it in their stack. It has no special function. During the game it will be just another agent card. The innocent bystander cards and the assassin should be kept in between, where both spymasters can 1 assassin reach them easily. The lights on the sides of the key card indicate which team starts. 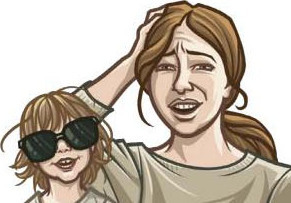 The starting team has 8 pictures to guess. The other team has 7. The starting team will give the first clue of the game. 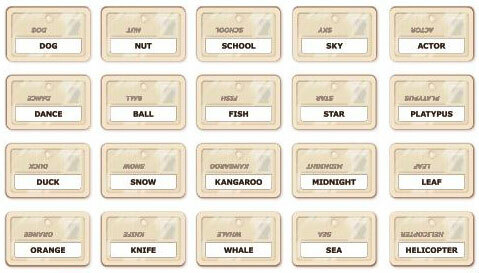 Spymasters take turns giving one-word clues. The word relates to one or more pictures on the table. The field operatives try to guess which pictures their spymaster meant. When a field operative touches a picture, the spymaster reveals who is in that location. If it is one of their team's agents, the operatives may keep guessing locations related to that one-word clue. Otherwise, it is the other team's turn. The first team to contact all their agents wins the game. Teams take turns, beginning with the starting team. (The starting team is indicated by the lights on the sides of the key card). On your team's turn, the spymaster gives one clue, and the field operatives may make multiple guesses. Example: A good clue for these two pictures might be evolution: 2. If you are the spymaster, your job is to think up a clue that relates to some of the pictures your team is trying to guess. Your clue consists of one word that relates to those pictures and one number that tells how many of your pictures relate to that word. You are allowed to give a clue for only one picture (kangaroo: 1) but it's fun to try for two or more. Getting four pictures with one clue is a big accomplishment. When the spymaster gives a clue, his or her field operatives try to figure out what it means. They can debate it amongst themselves, but the spymaster must keep a straight face. The operatives indicate their official guess when one of them touches one of the pictures on the table. If the field operative touches a picture belonging to his or her team, the spymaster covers the picture with an agent card in that color. The operatives may continue making guesses (but they do not get another clue). If the field operative touches a location with an innocent bystander, the spymaster covers it with an innocent bystander card. This ends the turn. If the field operative touches a picture belonging to the other team, the picture is covered by one of the other team's agent cards. This ends the turn. (And it helps the other team). If the field operative touches the location with the assassin, the picture is covered by the assassin card. This ends the game. The team that contacted the assassin loses. Your team's turn always has exactly one clue and one or more guesses. If the operatives' first guess is one of their team's pictures, they may make a second guess. If that's correct, they may make another guess, and so on. or if they have already made as many guesses as the number specified by the clue plus one more. For example: if your spymaster says evolution: 2, you can make as many as 3 correct guesses. This doesn't make much sense on your first turn, but later in the game it can be very useful. For example, you might have received several clues for which you did not get all the pictures. You can guess these pictures instead of or in addition to those related to the current clue. The "one more guess" rule gives you a chance to catch up. The game ends when one team has all their pictures covered. That team wins. It is possible to win on the other team's turn if they guess your last picture. 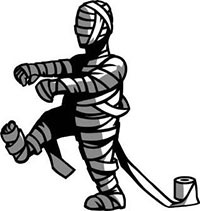 The game can end early if a field operative touches the location with the assassin. That operative's team loses. Do other people want a chance to be spymasters? Setup for the second game is easy. Remove the cards covering the pictures and put them back in their stacks. Flip over the 20 picture cards, draw a new key card, and you're ready to go! Spymasters are expected to give away no more information than one word and one number. Do not preface your clue with additional comments. "I don't know if you'll get this" is a fact that should go without saying. And "I don't know if you'll get this unless you've read The Hobbit" reveals way too much. Spymasters should not appear to be staring at one part of the board, and they must never touch the pictures once they have seen the key card. Keep a straight face when your field operatives are guessing. Do not reach for an agent card when your operatives begin discussing a picture. Wait until they actually touch it. When a teammate chooses a picture of the correct color, you must act as though that was the picture you meant even if it wasn't. If you are a field operative, you should focus on the table when you are making your guesses. Do not make eye contact with the spymaster. This will help you avoid nonverbal cues. When your information is strictly limited to what can be conveyed with one word and one number, then your victory will be even sweeter because you will win with honor. Your clue should be one word, no hyphens, no spaces. If you don't know whether your clue is one word or not, ask the opposing spymaster. If the opposing spymaster allows it, the clue is valid. All word play is allowed. So you can use knight to lead your teammates to a picture with a moon and a picture with a guy in armor. But that doesn't mean they will get it. You are allowed to spell your clue. This is helpful when you want your teammates to think k-n-i-g-h-t and not n-i-g-h-t, or when players have very different accents. You must spell out your clue if someone asks. In this case, you must choose either k-n-i-g-h-t or n-i-g-h-t and not reveal that you were trying to use both words. Your clue must be about the pictures, not about the patterns that cards make on the table or the letters in certain words or the shades of the pictures. Close: 3 is not a valid clue for the three cards closest to your operatives. S: 3 is not a valid clue for pictures of things that start with S. Dark: 2 is not a valid clue for the two darkest pictures. However, it is a valid clue for pictures of things associated with night, darkness, or evil. Singing, funny accents, and foreign words are generally not allowed, unless your group decides they are okay. Just remember that using a French accent to give a clue for a picture of the Eiffel Tower is only clever once. Your group may agree to relax the one-word restriction. 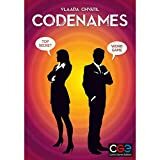 Maybe you would like to allow multiple-word proper names (James Bond, North Dakota) or abbreviations (FBI, FIFA) or even common compound words (merry-goround, scuba diver). To make the game more challenging, you may add some restrictions. For example, you may agree to not talk about the shapes of the pictures (circle: 3 or rectangular: 2). Tip: Giving a clue for one picture can be trivially simple, because you can just name something depicted in the picture. To spice things up, you can give a more creative clue that makes your operatives think a bit. But don't overdo it. You want to entertain them, not make them lose the game. Expert players may want to take advantage of two other types of clues described below. And the Assassin Ending is recommended for anyone playing Codenames: Pictures once they have played enough games to understand the basic rules. This variant is similar to eight ball, the billiards game. To win, your team must contact all their agents and the assassin. The game cannot end until the assassin is found. Even if all pictures of one color have been guessed, play continues. 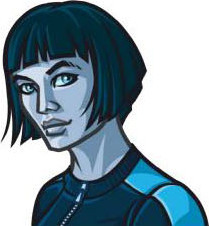 When an operative guesses the location with the assassin, his or her team wins if all of the team's agents have already been contacted. If an operative guesses the assassin and his or her team still has pictures that have not been guessed, their turn becomes a "sudden death" finish. The team gets no more clues. They keep guessing, trying to guess all their remaining pictures. Their number of guesses is unlimited, regardless of the number specified by the spymaster's clue. If they successfully guess all their remaining pictures, they win. 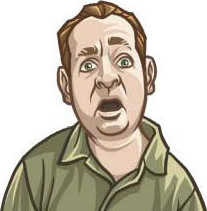 Any wrong guess (innocent bystander or enemy agent) ends their turn and causes them to lose the game. The game always ends on the turn when an operative touches the assassin. Contacting the assassin does not end the turn. Instead, it allows unlimited guesses for that turn. When that turn ends, they win if they have found all their pictures. You can allow your operatives to guess as many pictures as they want by saying unlimited instead of a number. For example, feathers: unlimited. This is especially helpful if you have given clues for multiple pictures that your team has not guessed yet. 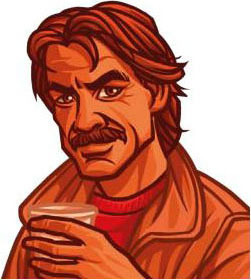 The disadvantage is that the field operatives don't know how many pictures relate to the newest clue. The advantage is that they may guess as many pictures as they want. You are allowed to use 0 as the number part of your clue. This means that none of your team's agents relate to that clue. For example, feathers: 0 means, "None of our pictures relate to feathers". If the spymaster gives 0 as the number, the usual limit on guesses does not apply. Field operatives may guess as many pictures as they want (as long as they keep guessing right, of course). They still must guess at least one picture. If there are only two of you, you can play on the same team. This two-player variant also works for larger groups of people who don't feel like competing against each other. You will try to get a high score against a simulated opponent. Set up the game as usual. One player will be the spymaster and the rest will be field operatives. The other team has no players, but you still need their stack of agent cards. Your team should go first, so be sure to pick a key card that makes you the starting team. Play your turns as usual. Try to avoid enemy agents and the assassin. The spymaster simulates the enemy team by covering up 1 of their pictures each time they get a turn. The spymaster gets to choose which picture is covered, so there is a bit of strategy here. If your team contacts the assassin, or if all the enemy agents are contacted, you lose. There is no score. 5 You could work for the Pentagon. 2 Now you're getting the picture. 1 Still better than losing. Note: Your score will be determined by how many turns you needed and also by how many enemy agents you contacted accidentally. Three players who want to be on the same team can play as described above. If two players want to compete against each other, they can be spymasters and the third player can be their operative. Setup and game play are as usual, except that the single field operative is working for both sides. (Just like spies in real life!) The winning spymaster is determined in the usual way. The field operative tries to do a good job for both sides. You can combine the two games together. If you like the new 5 × 4 grid, feel free to try it with words. Or, if you wish, you can also use the original 5 × 5 grid for pictures. (Use the 25 smaller agent tiles from the original game). You can also combine words and pictures in one game. Use either grid. Your clues need to be valid for both versions of the game. 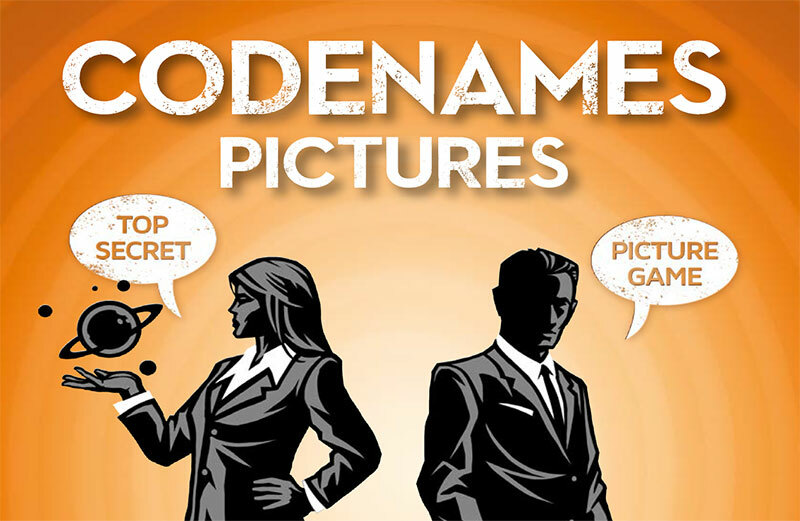 (In general, a clue that is valid for the original game is also valid in Codenames: Pictures). And regardless of what grid and cards you use, you can always try the Assassin Ending variant. Have fun!